Would you like to play "guess my avatar"? It’ll be up until someone guesses what my avatar is all about. Picard before he lost his hair? Is that a Belgian Shepherd, @seazen_? It’s a lovely dog. @Jude I don’t know, but it’s eerily similar to a movie I watched on my computer last night. Did you gt a new dog? Is it a breed from Israel? No, and no. But good guesses. Berger de Picard (Picardy shepherd)? @crisw Wins a week’s worth of macaroni and cheese. It’s about the Berger Picard Club of America! Established in 2006. Mmm, yummy. I’ll sprinkle the cheese on my popcorn. For once my mad knowledge of obscure dog breeds came in handy! @seazen In the link you gave us, it looks like a big furry thang with just a mouth! I just see Picard, explorer of the universal oceans. It’s Luc Picard of course. My dad was a big Star Trek fan. I would have known that either way though. His scalp shines like no other. @AGN The discussion is closed and the avatar is back to JLP. But you can join us in the chatroom. @AGN I…uh…I am shamed, and ready for execution. …my dad’s name was Jean. I cannot even believe myself. …hey HE watched it, I just walked by asking when it would be over so I could play some King Arthur themed video game, damnit. I love those monster Cane Corsos, or whatever they are called, the Brazilian guard dogs? Are you absolutely certain it’s not a Briard? OKAY – NEW AVATAR. GUESS THE CONNECTION. Yes, but that’s not the answer. You’re in Sweden. Bork Bork Bork!!! That would be too easy. Besides, I’m in Israel. Your name is really Tom. You’re going to cook that chicken and add some seazening to it. For those who missed it – it was the Swedish Chef. Why? I was asked whether Patrick Stewart (you know) was also a cook. I googled his name plus cooking and got a chef called Patrick Stewart who is apparently quite famous. Shall I do another one? You and half the guys here keep showng me their butts – for the last time – it aint happening. Sorry. But you can dream about me if you like. I don’t mind. So when is the next guess my avatar? – ? You’re retired LAPD and knew Tom Reddin. I won’t answer until I see the correct answer – so keep guessing… have fun. There is a connection to – well, me and my avatar. Anyone win the Macaroni and cheese? The answer is that Gene Roddenberry was an LAPD Sergeant. Yes – she is seven of nine – star trek – you get it. I measure in the red-zone for Trek geekiness. Of course I got it! Has Dr. J always hovered above a reflective surface? Can we make a nonsense thread? 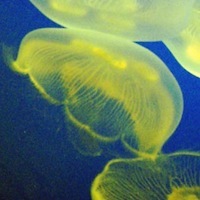 I noticed a lot of jellies happen to be online now - a lot of Sci-Fi nerd, geek, trekkie jellies - shall we battle? Play fluther scrabble with me? Are you this Jelly? The Jelly below me______ Part 12! Acronym game is fun, but too heavy to load with 150 plus posts; let's start a new one with a fluther/sea theme?